Kansas City’s FOX 4 spoke to ‘American Idol’ season seven winner David Cook during the American Idols Live Tour 2008 stop in St. Louis, Missouri. Cook talked about being able to make it back to Tulsa and the Kansas City area after winning the FOX hit. “It was a bit of a trip. People there seemed shocked to see me,” Cook said. “It’s still very odd because, I mean, I don’t feel any different. Maybe I’ve got a few more numbers in the bank account, but that’s about it. But it was cool.” Video at myfoxkc.com has since been removed. July 27, 2008 – ‘Good Day LA’ did a remote from the Phoenix auditions for season eight of ‘American Idol’ on Friday (July 25), running into last seasons’ ex-stripper turned ‘Idol’ finalist David Hernandez, who was covering the auditions for ‘Extra’. David said he’s getting ready do start a show at The Rrazz Room at Hotel Nikko in San Francisco and is working on new music, looking to land a record deal. The interview video at myfoxla.com has since been removed. July 22, 2008 – Footage of ‘American Idol’ season seven winner David Cook signing autographs for fans outside Allstate Arena in Chicago, Illinois before the American Idols Live Tour 2008 stop on Saturday (July 19) has been posted online. 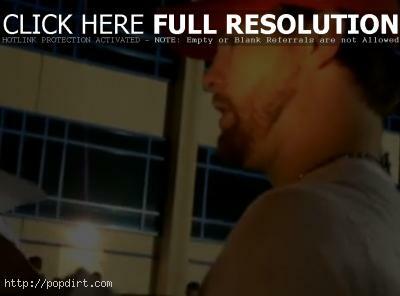 Cook sported a Kansas City Chiefs baseball cap and at one point asked the crowding fans shoving paper in his face to sign to back up a little. The clip ended with several fans chanting “Archuleta”, wanting to see ‘Idol’ runner-up David Archuleta.